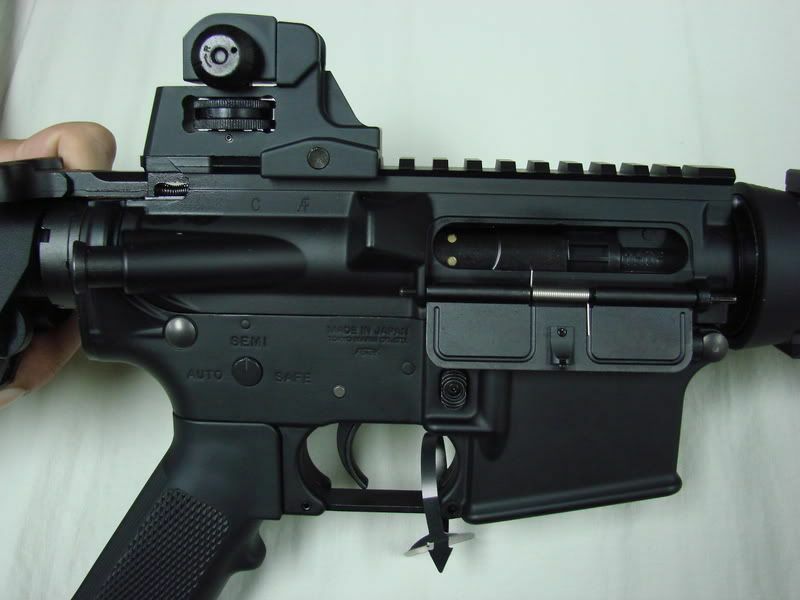 Initial Impressions of the Tokyo Marui SOPMOD M4 AEG. The newest offering from Tokyo Marui, the SOPMOD M4 follows in the new series of “more realistic” styled rifles aimed for the discerning player. While not as ultra realistic as the WA M4 or Systema PTW series, it does offer many of the same features and adds some new ones for considerably less money. The SOPMOD features a full metal body with ‘Colt’ markings, a crane style stock, full RAS hand guard, and detachable rear sight. It has a good weight, and no body flex. 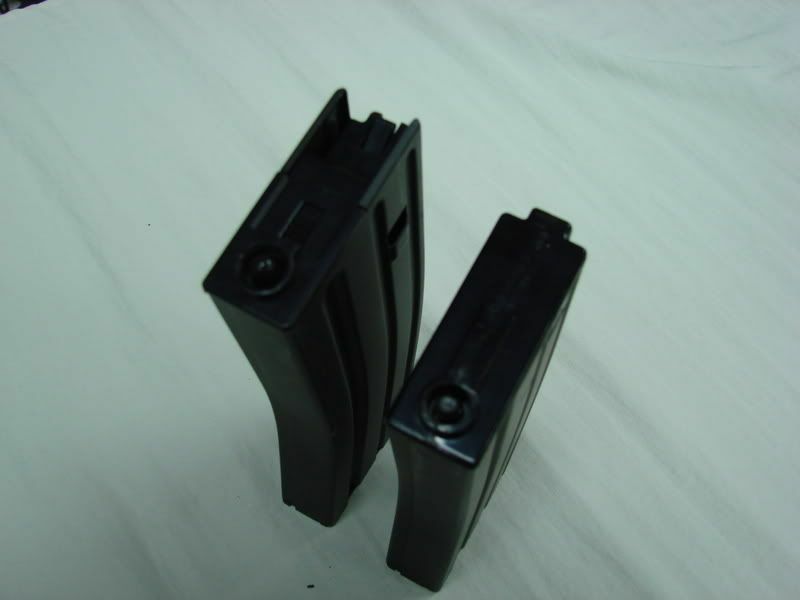 Magazines are a new design, and unfortunately, NOT interchangeable with older M4/16 designs. 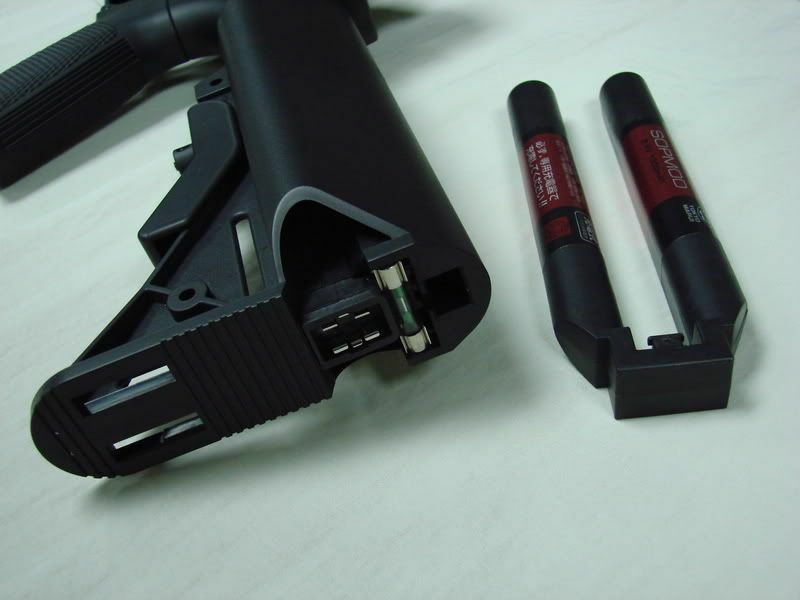 The gun also comes with the Battery adapter for the special Crane Style battery. 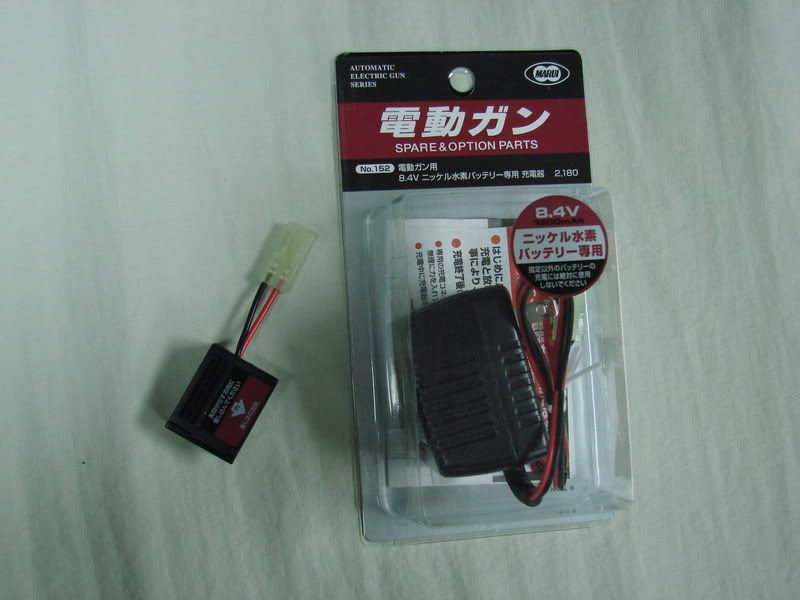 It uses a standard mini Tamia connector. A dedicated charger can be purchased separately. The new SOPMOD M4 uses a version of the new “Recoil Engine” found on the AK74MN and AK74U. It also adds a new feature a type of temporary electrical cut-off switch that will engage after the last shot in the magazine is fired, rendering the gun non-functional, just like the real thing. Reactivation of the gun is done by the now very functional bolt catch/release lever. (The gun will cycle without the magazine in the gun, however.) The bolt cycling is fast and crisp. Semi-auto fire is surprisingly responsive unlike, normal Marui trigger units. The “Recoil” is good, while not the kick from a WA M4, it does provide for an enjoyable experience. You still have to hold the gun pretty steady to get tight groupings, as the recoil will actually spoil follow-up shots. Magazines are completely redesigned for this new gun. They are not interchangeable with older designs. 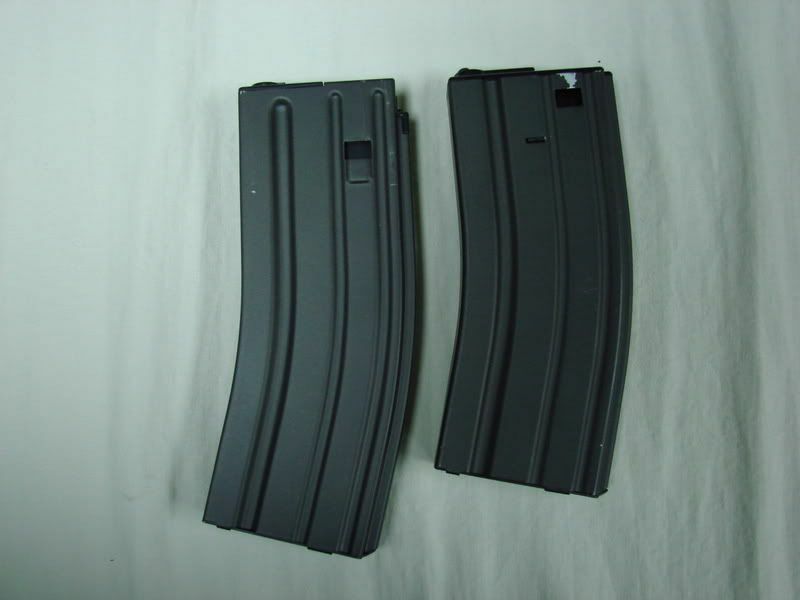 The quantity is now larger at 82 bb’s for a standard magazine, and 430 for the hi-cap. 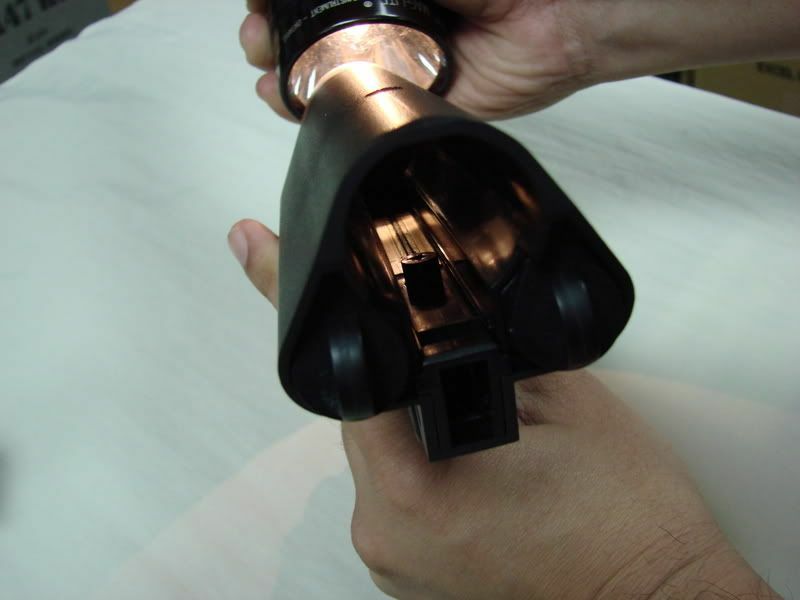 When using the hi-cap, the bolt stop function is disengaged. It is only in use with standard magazines. The hop-up is a barrel type similar to that of the G3/G36/AUG and can be accessed in it's usual place. 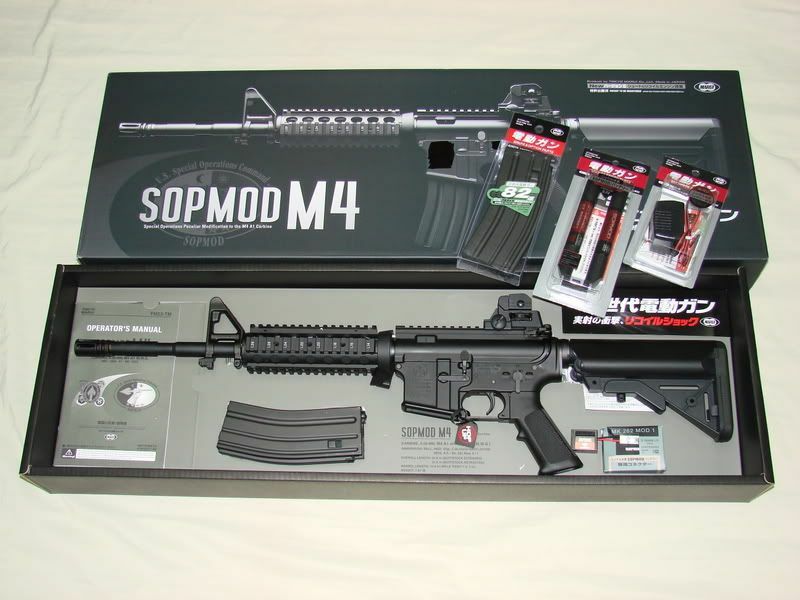 The SOPMOD M4 seems to fall right in the middle of the bunch between the very realistic (and expensive) WA M4 and Systema guns, and offers controlled and predictable performance above the G&G/Top-Tech and We Tech guns. While a lack of aftermarket parts availability seems to hinder it presently. Only time will tell. If this gun becomes more popular, then aftermarket parts manufacturers will most likely jump on, and we may yet see a new era in our toys. If you could fix the electric to the front, this M4 would be a good choice......the battery is to weak. I found this on You Tube when looking at the OPs links. Im really liking this. Will be on next years crimbo list at the current exchange rate though. Recoil looks pretty good. I gotta say I wasn't expecting much, but this new M4 seems pretty alright. The FPS and ROF are too low to use at most US fields, so hopefully the gearbox can still be upgraded. I'm glad that they changed the hop up to G36 drum style. Looks pretty awesome tbh, might buy it when i get cash. FPS might be a bit low, but it seems to have a fine rof for me. Not everyone needs to ###### BBs. Cool overview, thank you VERY much for the videos. Im really interested in this as i prefer the reliability and convenience of electric over gas powered replicas. I really hope that this platform catches on and aftermarket parts are released in short order. Only time will tell however. Well, companies are making parts for PTW's, and those are 3x more expensive. Since people can afford this, it should catch on fast. Nice try, but can I swap the EBB feature with a split gearbox and PTW-style quick changing cylinders? This AEG looks FUN. The pseudo blowback, the bolt lock, the (hopefully) exceptional hopup performance and genuine tokyo marui reliability make this one a winner in my book. This gun is definitely on my short list to own. 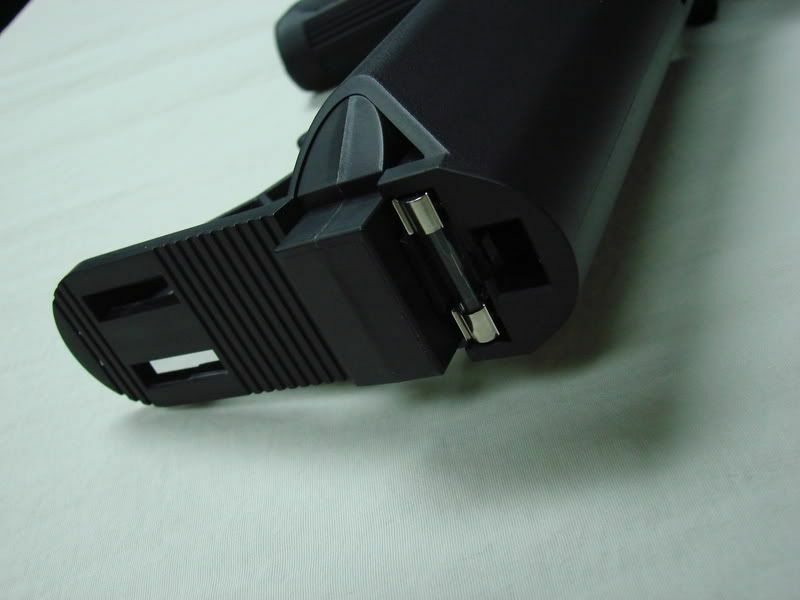 Is that hole next to the charging handle or whatever normal? 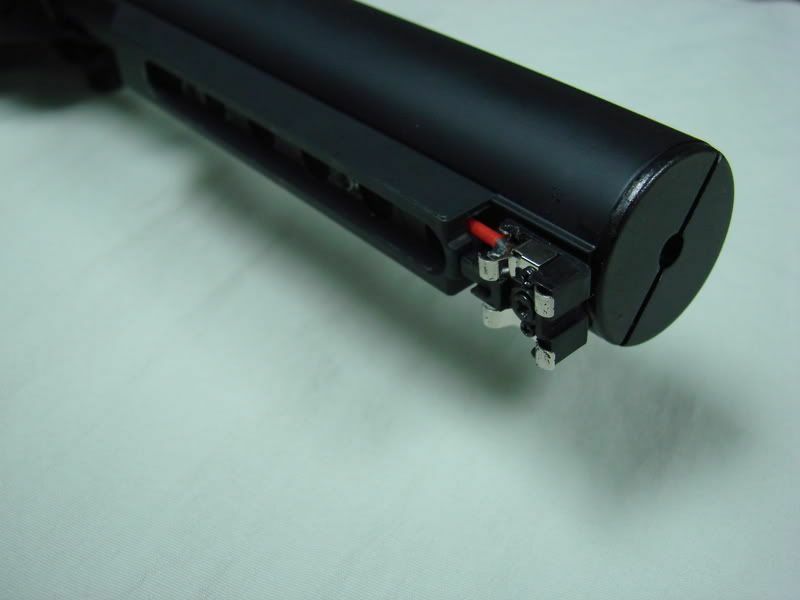 ^you mean the holes in the faux bolt carrier? 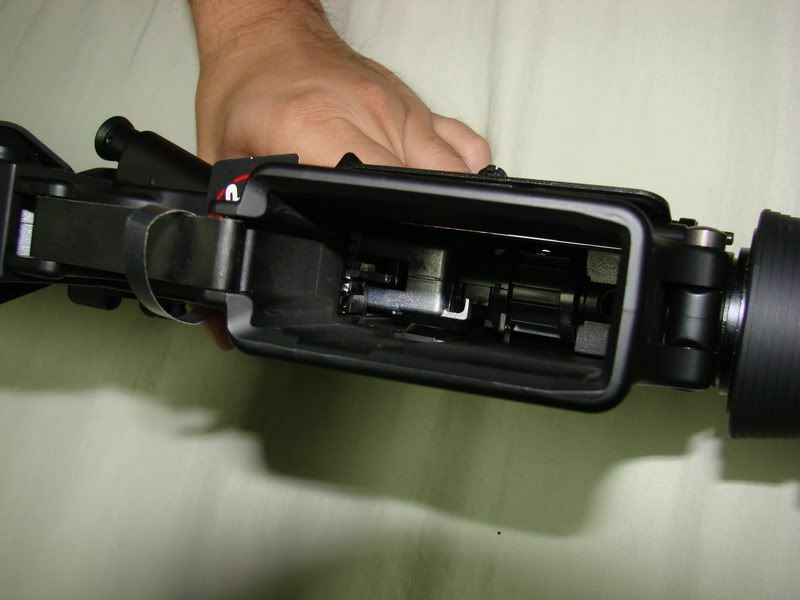 In the real steel, that is where the gas from the direct impingement system escapes when it pushes the bolt carrier far enough to unlock. It is apparently recreated in the TM version. Please please please take pics of the recoil mech and inside the gearbox and explain how it works! And is there any way to make the recoil heavier, or kick harder like a real M4? It shouldn't be too hard, with a heavier weight, stiffer springs, beefier battery, and high torque gears, unless I am missing a part of the equation somewhere? I can imagine this exploding in popularity. With that comes aftermarket parts, which I can only think would include recoil boosting and reinforcing parts. Im really psyched for this design. The sky is the limit and i really cant wait to see what guys with more talent, skill and knowledge than the average joe, ie me are going to do to this rifle. I too would love to see how this thing works before i plunk down the cash on one. I just fired a TM AK74 two weeks ago and of course the blowback is weaker than the WA M4 one ( it was an upgraded one with the stronger recil spring). But the blowback was strong enough and also impressive. AND I was able to hit a target some 60 feet away. Something I didn´t manage with the WA. So in my humble oppinon TM found a good compromise: Blowback and accuracy. And you will never experience real steel feeling with a toy gun. Glad you guys a small review on it gunfighters, I am definitely gonna check it out at your store when I get the time. Me, well, I'm gonna pass on this one and wait for Marui to release the blowback MP5 that they patented the internals for at the same time they patented the internals for this new blowback M4. I always have had a thing for MP5s and I don't think I'll have to wait more than 6 months to a year for Marui to come out with the new blowback version. This should help in the mean time. This is the parts list for the gun. I´ve seen this scematic before. How did they fasten the barrel zu the upper receiver? Can someone who has one of these please disassemble it and confirm how it works? also, does it have the recoil spring *boing* like the real steel?